The charming and eccentric humor of this vampire mockumentary makes it feel like it was born to be a beloved cult classic. 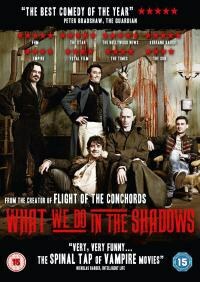 It's unusual to see a new film and know instantly that you've just watched a solid gold cult classic, but that is the case with What We Do in the Shadows, the new comedy from co-directors Taika Waititi and Jermaine Clement. This is a clever little movie which will be watched and enjoyed by equally clever but sparse audiences for years to come. For people in those audiences, the designation of "cult classic" is not for a second intended as faint praise; it's simply a statement of fact. By way of explanation, the top comedy at the UK box office is currently Get Hard, a movie destined to be no-one's favorite movie, one which will be forgotten about in a year's time. It's a movie which, if such a thing were possible, would be in terms of edification and fun the equivalent of rubbing anthrax into your lower frontal lobes. What We Do in the Shadows is a much funnier film than Get Hard, but will be seen by about one percent as many people. Even if it had the commercial Viagra used to pump up the numbers of a disaster like Get Hard -- namely household stars on the poster, an enormous promotional budget, and a wide theatrical release -- What We Do in the Shadows could never hope to match the popularity of the latest Will Ferrell vehicle. While in this case that vehicle may be on fire and veering towards a pet hospital, the jokes of Get Hard are big, broad, and immediately familiar to any sentient viewer. By contrast, What We Do in the Shadows is esoteric in its subject matter, quirky in humour, and relatively hushed in its delivery. It does not appeal to the lowest common denominator. In this sense, What We Do in the Shadows is a cult classic; it will certainly be someone's favourite movie. Although What We Do in the Shadows succeeds, it could be argued that it does so in spite of some self-imposed obstacles. Set in suburban Wellington, NZ, it tells the story of four house-sharing vampires as they struggle to come to terms with the modern world. That's right: it's a horror-comedy. While there are successful examples of this hybrid genre -- Ghostbusters and Gremlins, to name just two brilliant examples -- it's arguably a tougher exercise to get right than straight horror or comedy. A good horror-comedy must respect the demands of whichever horror sub-genre it is following. If it appears to be ignorant of its own DNA, then horror fans will walk away. Part of the fun of Shaun of the Dead, for example, was the play on zombie movie tropes, and that is also the case with What We Do in the Shadows. The movie shows an awareness of generic clichés and gently deflates some of the expectations which accompany them. The vampires are not the hip teen idols of Twilight, but rather examples of figures from throughout vampire cinema's long lineage. For example, Viago, played by Waititi, is a romantic Bram Stoker-era dandy, whose foppishness now manifests itself in fussiness over cleaning rotas and household chores. Vladislav, played by Clement, is a Vlad the Impaler-esque ex-tyrant, who finds his murderousness and lust somewhat wilting under 21st-century pressures. For horror fans, the character of Petyr is perhaps the most interesting. He's a grotesque Count Orlok style monster who lives in the basement. Out of sight, out of mind, he's an example of a part of vampire heritage which has been largely written out of representations of the vampire in recent pop culture. It should have been Petyr who seduced Kristen Stewart. In fact, it's worth imagining all the Twilight movies with Petyr in place of Robert Pattinson -- they're better, right? The other cross which What We Do in the Shadows has to bear is its mockumentary format. Over the last decade or so in comedy, the fake documentary has become an over-used device, featuring in The Office and its American adaptation, Arrested Development, Modern Family, Summer Heights High, and numerous others. Whereas once it was possible to date a show by its multiple-camera set-up, now the ubiquitous contrivances of the mockumentary format fulfill the same function. The baffled "mug to camera" is the current equivalent of canned laughter; it completes the joke and prompts the audience. Now, while those examples are all TV shows, in this age of "content", the same rules and in this case problems hold true for movies. The all time classic comic mockumentary may be a movie, but television has taken the conceit, worn it into the ground, and made it difficult for any movie to apply the format without having audiences do their own (unfeigned) eye-rolling. However, to the credit of What We Do in the Shadows, the film mostly avoids the tired conventions of the format. Viago indulges in a little of the prenominate nervous mugging to camera, but not so much that it becomes irksome. Most importantly, the documentary device is integral to the movie. Parks and Recreation would be an outstanding comedy with or without its ever present documentary crew; in the case of that show the device was unnecessary. It is difficult, though, to see how What We Do in the Shadows could have told its story without using the mockumentary form. The whole tone of the film would have shifted and become something more farcical. The most important thing is that the movie is funny. It beautifully plays on the absurdity of these vampires in a modern setting, exploiting and exaggerating the more ridiculous aspects of the vampire myth for all they're worth. What happens if a vampire eats a french fry? Well, you'll find out. Beyond its humor, the lasting quality of What We Do in the Shadows is its charm. Part of what has allowed This Is Spinal Tap, that aforementioned "greatest mockumentary of all", to endure is the warmth of St. Hubbins and Co. They're idiots, and the audience loves them. It's something which What We Do in the Shadows shares with its forebear, and which perhaps is all the more remarkable in the case of Waititi and Clement's movie given that the characters spend half their time trying to violently murder innocents, preferably virgins. Somewhere between the improvised dialogue of an excellent cast and whatever characterizations were laid out in the script, these immortal killers become increasingly sympathetic, and the audience starts to care about what happens to them. As big as the jokes are, it's this which will prompt so many repeat viewings of What We Do in the Shadows in years to come.